After all the feasting of December, this light, apple-based dessert provides a welcome contrast. The smell of oats mixing with the butter, maple syrup and spicing is just the thing to lift a grey winter’s day. If you have any leftovers, it’s also great warmed up in the oven for breakfast the following morning. GLUTEN-FREE OPTION: To make this as a gluten-free recipe, make sure you use gluten-free certified oats. I used Royal Gala apples, and our Shipton Mill pinhead oats (please note these are not gluten-free). Preheat your oven to 180°C. Slice the very tops of the apples off and remove any stalks. Using a sharp knife, remove the core, and slice out the inside of the apple until you have a hollow for the filling. Take care not to split them. Place them on a baking tray. Melt the butter, sugar and maple syrup together in a small saucepan over a low heat. Add the rest of the ingredients and combine. 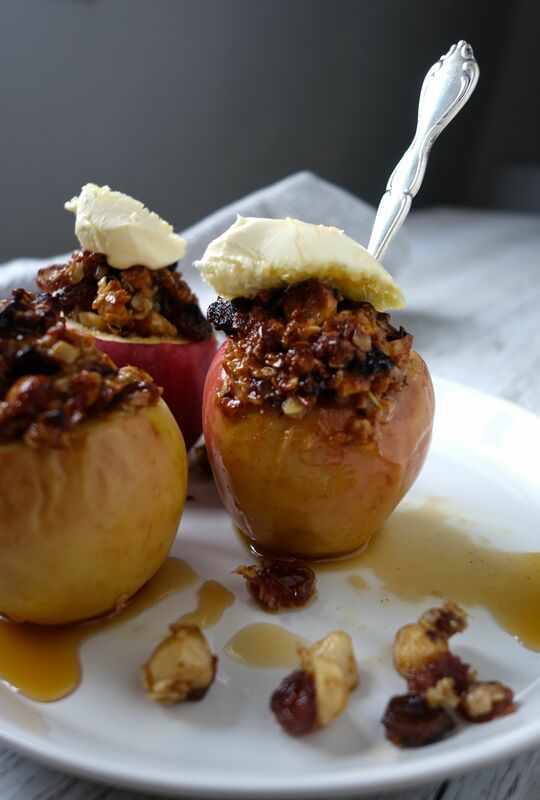 Use a teaspoon to fill the apples with the oat filling. If you have any leftover, just place it on the baking tray for extras. Place the apples in the oven and bake for 20 minutes. Serve with clotted cream or ice cream, and drizzle with extra maple syrup if desired. Eat while still warm from the oven.